Arkhan is a Deathmage neither, but he can chose form the lore. The Keyword is Wizard. Deathmage is a Faction, consisting Necromancer and Mortis Engine. Thus the Guardian of Souls is a wizard it should chose a Spell from the lore to. Hey guys, since the FAQ to the Legion of Nagash Battletome all Nighthaunt models from the Soul Wars Box are legit. My question is if i am allowed to choose a spell (from which lore?) 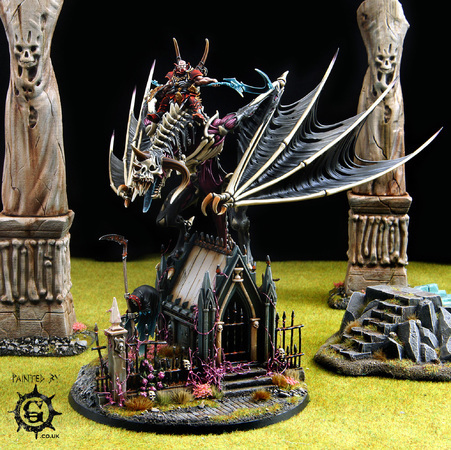 when picking a Guardian of Souls in a Legion of Nagash list? Sorry i didn't thought about the restictions for the campain. For 1000 Ponits i would go something like that: Allegiance: Flesh Eater Courts- Grand Court: Court of Delusion - The Feast DayLeadersAbhorrant Archregent (200)- Artefact: The Dermal Robe - Lore of Madness: Deranged TransformationCrypt Infernal Courtier (120)- General- Trait: Dark Acolyte Battleline6 x Crypt Flayers (340)6 x Crypt Flayers (340)Total: 1000 / 2000Extra Command Points: 20Allies: 0 / 400Wounds: 61 You are able to cast up to +4 Attacks to one of your Units of 6 Flayers. Thats crazy. its +100% more Attacks. Paired with feeding frenzy in both turns in a round you got 400% more Attacks than usual... Summoning a second infernal or a varghulf. You can swap the artifact to Grim Garland. -2 to bravery to the Flayer screams is insane. But you have to be within 6" to the enemy unit. Fighting against BCR depends on the Behemoth he picked. If it is a stonehorn be aware of th charge. it does D6 MW on the charge and halfes your damage characteristic. So you are safe with flayers. Horrors of GKoTG are affected. If he picked the Thundertusk just be save and deploy more than 29"(18" shot + 8" move +3" wind) away form it. with your heroes. that 6 MW on a +2 is terrible. Yeah its 42%, but the other 58% it does nothing to 1-3 Mortal Wounds. You have to include, that the spell can be unbound, so its far less than 42% in sum. Maybe pay 40 Points for Geminids of Uhl-Gysh and you got that sweet -1 to hit and -1 to Attack (not both on the same enemy unit). Here you got more range because of the predatory movement. Its up to you what you want to do with them. Harbringer's 3D Charge is sweet. In a Legion of Night List in ambush you definitly want Harbringers. If you want to go with Nagash in the Battalion you should chose Archai. Most of the time when i play Morghast i play in a Legion of Nagash list, so they get +1 Attack. Mathematical +1 Attack on Helberds is far better than one more swords attack. Assambling Morghast is not that terrible. You should paint the Archai armor and the weapons first, befor you glue them together. Painting was a bit tricky. For the bones i used Agrax Earthshade. But i painted the little Skulls underneath the bones first. So i had paint the skulls again because the Agrax dropped on the skulls. I think one of my lost games i learned the most was against one of my friends. I often play very aggresive and most of the time i forget to check if my units are wholly within x" for my buffs. I outposition my own units because i am so greedy and want to feed my FEC. Sometimes when i got high charge rolls and try to be tricky or sneaky by engaging enemy heroes, my units are to far away from the objectives. Once i lost a game even though i tabled my opponent. He won the game becaus he scored more points. From this day i try to check if a charge is necessary, i masure the distance to my heroes. Points gained by objectives win the game, unless there are killpoints. Hey guys, i want to ask you where you deploy your throne and why. In most of my games i am not sure which place seems to be the best. when i know i am able to decide which one goes first its a big plus. but even then i am not sure to 100%. When i know i will go first turn, most of the time i deploy my throne on the left or right side of the table something about 4"-6" away from my deploy zone. So i can walk with my Archregent to the throne. First thing that i can summon for free and the other plus ist the cover of terrain. Want i don't like is, that my Archregent is stuck in one corner of the table. So his casts may can't reach my unit i want to buff with him. Maybe in the upper case it is the easiest way to decide where to put that throne, but when i can't decide which one begins, due to more drops. Should i put the throne in the middle of my deploy zone. deploy the Archregent one the throne and don't move in the first round? "Just" for the free summoning and the cover? One plus is that i nearly can guarantee that my units are within casting rage. Depending on the scenarios there aren't much more good choices for the throne. So, what do you think? where you put you throne on the table and why you think its a good choice? Hey Guys, i played FEC form the beginning as my first army. I liked them a lot. Their fluff is kinda funny and they are quiet cheap building an army. Times changed, new Battletomes where released and FEC lacked in some Point compared to the other armies. No Spells, no Allegiance Abilities, sniping out our Heroes and so on. GHB 2017 changed a litte bit but that was not much. With the release of the new battletome FEC got a whole bunch of love. Flayers and Terrorgheist get huge buffs. Feeding Frenzy got insane and look out Sir! helped very much. So i gave my little cannibals a chance and tested them. i am very impressed. i played 5 games and won all of them with ease. In this topic i want to share my games with you in battlereports. Here i can explain how i played my games, why i make some decissions and what i think was wrong. you are welcome to ask questions or give me some advices to improve my gameplay. My first game i documented for a blattereport was against a heavy shooting Storm Cast army. The Lists are: Allegiance: Flesh Eater Courts- Grand Court: Court of Delusion - The Feast DayLeadersAbhorrant Archregent (200)- Artefact: The Dermal Robe - Lore of Madness: Deranged TransformationAbhorrant Ghoul King on Royal Terrorgheist (400)- Lore of Madness: Blood Feast- Mount Trait: Gruesome BiteCrypt Infernal Courtier (120)- General- Trait: Dark Acolyte Crypt Infernal Courtier (120)Abhorrant Ghoul King (140)- Lore of Madness: Miasmal ShroudBattleline9 x Crypt Flayers (510)40 x Crypt Ghouls (360)10 x Crypt Ghouls (100)Endless SpellsChalice of Ushoran (40)Total: 1990 / 2000Extra Command Points: 0Allies: 0 / 400Wounds: 125 Allegiance: Stormcast Eternals- Stormhost: Anvils of the HeldenhammerLeadersLord-Castellant (100)Lord-Relictor (100)- Prayer: TranslocationLord-Arcanum on Gryph-Charger (240)- General- Trait: Deathly Aura - Artefact: Soulthief - Spell: Celestial Blades- Mount Trait: Aethereal StalkerKnight-Incantor (140)- Spell: ThundershockBattleline10 x Sequitors (240)- Stormsmite Mauls and Soulshields5 x Sequitors (120)- Stormsmite Mauls and Soulshields5 x Sequitors (120)- Stormsmite Mauls and SoulshieldsUnits9 x Vanguard-Raptors with Longstrike Crossbows (540)10 x Evocators (400)- 5x Grandstaves- Lore of Invigoration: Speed of LightningTotal: 2000 / 2000Extra Command Points: 0Allies: 0 / 400Wounds: 111 We played Threee Places of Power Deploy: 10 Sequitors and 10 Evocators placed in Realm. GKoTG on my left, Throne, 10 Ghouls and AA on my right. 9 Flayers with 2 Courtiers in the back and 40 Ghouls + (bubblewrapped) GK in the middle. My Turn in the First Round. First of all i realised that my unit of 9 Flayers was deployed more thatn 24" away form my AA. So i can't cast Deranged Transformation and neither Ferocius Hunger on them. So both spells where cast on the 10 Ghouls. Black Hunger and mystic shild on my Flayers. Unholy Vitality got a 5 and wasn't casted. I ran to the objective with my flayers. GKoTG went to the left objetive. I summoned 3 Flayers and one Varghulf on my right. I got 3 Points First Round 2nd Turn: Helden Hammer Command Ability on the 9 Raptors, they shot my GKoTG and make 6 Wounds. Teleport didn't work. Blades on 5 Sequitors, Shild on the other 5 Sequitors. Both Sequitors move forward onte my flayers. Evocators shocked 9" away from Flayers in his territory, 10 Aequitor shocked 9" away from my summoned flayers. In the shooting Phase Raptors shot 8 Wounds my GKoTG, just 1 Wounds left (!). He charged my GKoTG with his Castelant and Griffhound. 10 Sequitors charged my summoned 3 Flayers. both Units of each 5 Sequitors charged my Unit of 9 Flayers. Evocators missed theirs charge. My GKoTG survieved the attacks and killed both, Castelant and Griffhound in attack. One Flayer of the summoned unit survived. both units of 5 Sequitors killed some Flayer. Flayer killed some Sequitor. No Points for Stormcast. 2nd Round First Turn. I won ini. Mustered some new flayers, both units filled. GKoTG recoverd 1 Wound. Not a singel Spell was casted. Just put my Calice between the left and the middle Objective. In my shooting Phase the 3 Unit Flayer screamed the 10 Sequitors to death. Unit of 9 Flayers do average. Combat Phase 3 Flayer shine again and killed 6 Sequitors. One unit of 5 Sequitors was extinished the other with shild buff just 1 left. 6 Points for me. 2nd Round 2nd Turn. He killed my GKoTG with the Raptors in his hero phase. teleported his Relictor to the left Objective (whre my TG was before). In his shooting phase his Raptors killed my GK. Evocators charged my unit of 9 flayers and one Courtier was within 3". His Evocators killed 4 flayers and his Mortal Wounds killed the Courtier which was within 3". My Flayers killed 6 Evocators in 2 Attacks. he got his first Point. 3rd Round 1st Turn. Stormcast beginns. Raptors killed my General in his Heros Phase. no casting. Raptors do 8 damage to my Flayers, just 3 left. Evocator killed all my flayers in his combat phase. His General get the objective in the middle. he scored 3 points and is on 4 points now. My 3 Flayers and the Varghulf killed all his Sequitors. 3rd Round 2nd Turn. Deranged Transformation on my Flayers. Ferocius Hunger +1 on the Flayers. 10 Ghouls charged his Evocators. 3 Flayers charged his General and killed him in the combat phase. 1 Ghoul survived the attack of 4 Evocators. Good little one, so he blocked their movement in the next round. i socred 3 Point. tis 13 to 4. 4th Round. i won ini roll. he isn't able to get enough point even if he could clear the board. FEC won the game due to points. So in this game my best decission was to start the game and claim all 3 objectives. The unit of 9 Flayers did a good job. it was a big mistake to deploy my AA more than 24" from my flayers. i have to check this next time in deploy. Summonig the 3 Flayers and the Varghulf next to the right objective was good to. they blocked the 10 sequtors so my AA was save all the time. my blob of 40 ghouls did nothing all through the game. that was really disappointing. compared to my games with 40 Skellis this was a joke. Feast Day is so strong. can't even think about it how i played FEC before this battletome. There are no restrictions in picking Mount traits. Every Mount can pick a trait. You can pick the same trait more than one time. XRen you need 2 more battlelines or your GKoZD can't be your general. Your Crypt Haunter Courtier has to be the general. 150 Points left? Just to get 3 Command Points? Just use the Throne for summoning and you don't need that much spare Command Points. Add the 10 Ghouls for 60 Points. I don't know how you want to use the Vortex? Cast it under your Ghoul King? Then he can't move and can't buff your troops. I drilled quiet big holes 3mm in the arms, wing and body. used magnets 3mm diameter and 2mm higt. it worts really good. you just have to drill the holes depp, so got don't get any gaps between the limbs and the body. Hey Guys, new FEC Battletome is out now and i want to know how and if one thing works or not. It's about the Gristlegore Grand Court Command Trait Savage Strike and the generic FEC Command Ability Feeding Frenzy. Savage Strike: "This General fights at THE START of the combat phase ..." Feeding Frenzy: "... after a frendly FEC unit has fotght IN THE combat phase..." My friends and i often seperate Start, middle and End of a phase. Does it work? Can i use Feeding Frenzy after my generl fought with Savage Strike?